(a) Check brake pedal height. (b) Adjust brake pedal height. Disconnect the connector from the stop lamp switch assy. Loosen the stop lamp switch lock nut and remove the stop lamp switch assy. Loosen the push rod lock nut. Install the stop lamp switch assy. Connect the connector to the stop lamp switch assy. Push the brake pedal in 5 to 10 mm (0.20 to 0.39 in.) and turn the stop lamp switch assy to lock the nut in the position where the stop lamp goes off. After installation, push the brake pedal in 5 to 10 mm (0.20 to 0.39 in. ), and check that the stop lamp comes on. Tighten the stop lamp switch lock nut. (a) Stop the engine and depress the brake pedal several times until no vacuum remains in the booster. (b) Press the pedal until resistance is felt. Measure the distance as shown in the illustration. If incorrect, proceed to the following step. Check the stop lamp switch clearance. If incorrect, adjust the stop lamp switch clearance. (a) Release the parking brake pedal. (b) With engine running, depress the pedal and measure the pedal reserve distance, as shown in the illustration. Pedal reserve distance from asphalt sheet at 490 N (50 kgf, 110.2 lbf): More than 83 mm (3.3 in.) If incorrect, troubleshoot the brake system. (b) Disconnect the stop lamp switch connector. (c) Disconnect the pedal force switch connector and release the clip of the pedal force switch. (a) Remove the bolt, the 4 nuts and the brake pedal support assy. (a) Remove the nut, the brake pedal shaft and the brake pedal sub-assy from the brake pedal support sub-assy . (a) Remove the brake pedal pad from the brake pedal sub-assy. (a) Loosen the stop lamp switch lock nut and remove the stop lamp switch assy. (a) Remove the 2 brake pedal bushes from the brake pedal sub-assy . (a) Remove the brake pedal shaft collar from the brake pedal sub-assy . 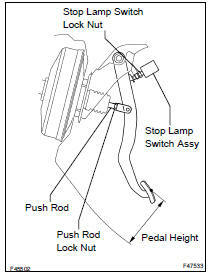 (a) Remove the stop lamp switch cushion from the brake pedal sub-assy. 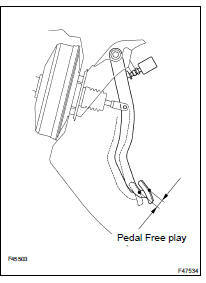 (a) Install the stop lamp switch cushion to the brake pedal sub-assy. (a) Apply lithium soap base glycol grease to the ends and sides of brake pedal shaft collar. (b) Install the brake pedal shaft collar to the brake pedal subassy. (a) Apply lithium soap base glycol grease to the ends and sides of 2 new brake pedal bushes. (b) Install the brake pedal bushes to the brake pedal subassy. (a) Install the stop lamp switch assy with the stop lamp switch lock nut. 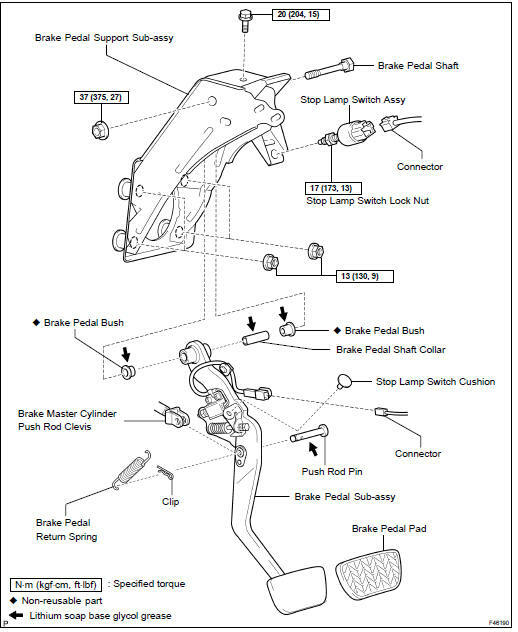 (a) Install the brake pedal pad to the brake pedal sub-assy. (a) Install the brake pedal sub-assy with the brake pedal shaft and the nut. (a) Install the brake pedal support assy with the bolt and the 4 nuts. (a) Apply lithium soap base glycol grease to the clevis pin. (b) Install the clevis pin and the clip. (c) Connect the pedal force switch connector and install the clip of the pedal force switch to the brake pedal support sub-assy . (d) Connect the stop lamp switch connector.